Embracing solar is easier said than done for many power companies. When the world wide web first came onto the scene, the dominant supplier of proprietary software, Microsoft, was forced to adopt the internet to stay relevant. Could there be a lesson here for utilities grappling with the disruptive nature of distributed technologies like solar? Much like tech companies of the 1990s, utilities face an “unavoidable shift” and don’t have any choice but to embrace distributed solar, argued executives from Clean Power Finance in a webinar recently hosted by the Solar Electric Power Association. Given that Clean Power Finance operates online exchanges for distributed solar financing, it shouldn’t be surprising that the company is bullish on the potential of utilities and distributed solar. Still, the discussion unearthed some of the issues that have made many utility executives uneasy about the rapid rise of distributed solar. It’s a dynamic that has led to reviews of net energy metering laws in California and Arizona and much discussion over whether power providers will be marginalized as more consumers adopt distributed energy. In an attempt to define and understand these changes, Greentech Media also released its grid edge concept this week, which categorizes the shifts in hardware, services and business models in the power sector. No one disputes that the prospect of smaller electric bills or even losing customers outright could be deleterious to utilities. But how do these companies, many of which are investor-owned, actually make money in distributed energy? It’s an important question to all electricity users since utility bills help pay for the upkeep of the physical infrastructure -- the poles and wires that bring power to homes and businesses. Without viable business models, utilities could struggle to fund operation of the grid which, in many cases, needs upgrading today. Kristian Hanelt, senior vice president for renewable capital markets at Clean Power Finance, laid out three possible business models for utilities to profit from distributed solar. 1. Utilities invest in residential solar outside of their regulated territory. Much like a utility invests in centralized power plants or wind farms, it can invest in many rooftop solar installations. The advantage is that the utility now has a relationship with a new customer to whom it can sell additional services. 2. A utility owns distributed solar assets in its own territory and earns a return as it would on other investments. The utility could purchase solar from an independent power producer and resell it to the consumer at a profit in some cases, according to Clean Power Finance. The utility has a low cost of capital and is a trusted and known brand compared to solar installers or financiers, Hanelt said. This could also help meet renewable portfolio standards. 3. The third model is one where the utility offers solar as part of a “value-added service model,” in which solar is a “gateway” via which to upsell other technologies, such as EV charging stations or smart thermostats. The utilities that actively explore new business models in distributed solar, rather than fight them, will benefit the most because they’ll have a lead on others, Hanelt argued. There are already a handful of examples of utilities getting their feet wet in distributed solar. This summer, Edison International announced plans to buy solar installer SoCore, and NextEra Energy Resources bought Smart Energy Capital, which offers solar financing. Also, Duke Energy invested in Clean Power Finance this summer. Judging from the questions posed during the webinar, it’s clear that embracing distributed solar is more complicated than partnering with an existing solar company. One questioner noted the difficulty of selling a product -- that is, distributed solar -- that eats into revenue a utility earns from its existing service. A number of participants also noted that it’s still not always clear to regulators whether distributed solar is covered under the monopoly that utilities are granted. The questions underscore one of the big differences between technology disruption in electric power compared to other industries. Unlike IT, for example, the utility industry is highly regulated, which means incumbents don’t have the same flexibility to change. At the very least, it suggests the industry will change slowly as the business models and regulations change to fit new technologies. 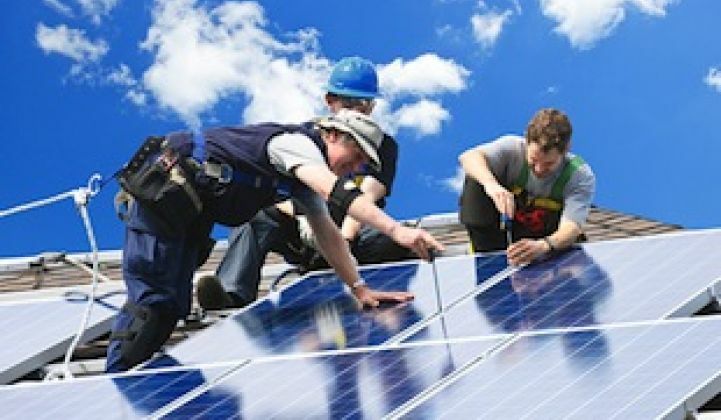 Lyndon Rive, the CEO of solar installer SolarCity, said that utilities can participate in distributed solar in a similar way to how they do business now -- that is, investing in power assets and earning a return on equity. But it needs to be done on the deregulated side of the business for that to work. Utilities could invest profits from the regulated side of the business to expand into distributed solar and take on new customers, Rive said. For now, though, few utilities are actively participating in distributed solar. That means those companies trying to square their current business models with distributed solar need to get it right.